Cooking up sweet potatoes in nothing but their skin like you're a Boy Scout on a camping trip is fine. But mashing them allows you to customize the flavor and texture a bit more, which is crucial for sticking to a nutrition plan! Bring a medium pot of water to boil over high heat. Prep sweet potatoes by peeling and cutting into small cubes, about 1/4-1/2 inch each. Add prepped sweet potato to boiling water. Boil for about 10-15 minutes. The potatoes are done once they're easily pierced with a fork. Remove pot from heat and drain excess water. Using a hand masher or spoon, begin to mash potatoes to desired consistency. Add salt for flavor. At this point you can add the milk if desired, starting with 1/4 cup. Continue mashing and, if needed, add an additional 1/4 cup of milk. 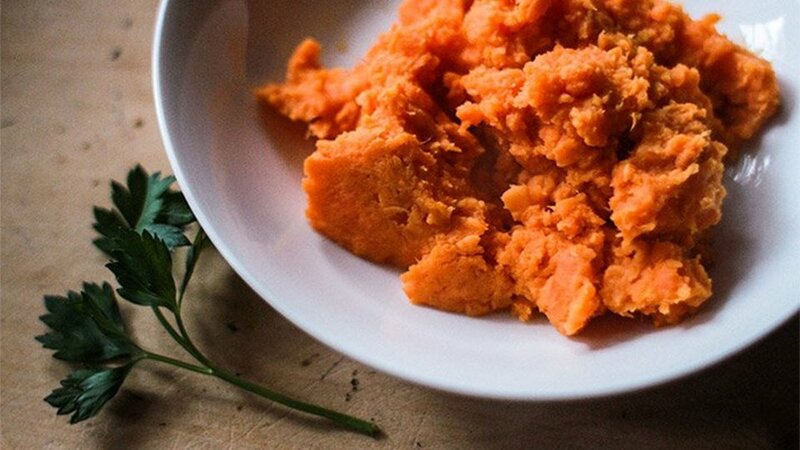 Once the sweet-potato mash has reached your desired consistency, add a pinch of cinnamon.